It has always been seen as either a distraction or a bad influence, and in some ways it’s true: We all have heard about the South Korean dude who died after playing an online computer game for 50 hours straight. But we knew it's not all bad. In our recently published article "When Bad is Good," we learned that video games has some real benefits: apparently, video games help promote better hand reflexes and improved hand-eye coordination. Awesome, right? Oh, but that's just the tip of the video game iceberg. Recent events show that video games actually help the universe. We list four precious proofs that should change our old folk's minds about video games, if only slightly. 1. Video games can help you lose weight! A 17-year old American boy named Taylor LeBaron reportedly went from 300lbs to 150 lbs in 3 year’s time– thanks to a regimen called the Videogame Diet. The kid reportedly counted how many calories – converted to money – he had to spend each day. A cookie, for example, would cost him 200 points. Whenever he exercises, his cash money increases. His mother and grandmother played along with LeBaron that they also lost weight: 75lbs and 45lbs respectively. LeBaron is currently writing a book titled “Cutting Myself in Half: 150 Pounds Lost One Byte at a Time”. 2. Online games can help you catch a crook! 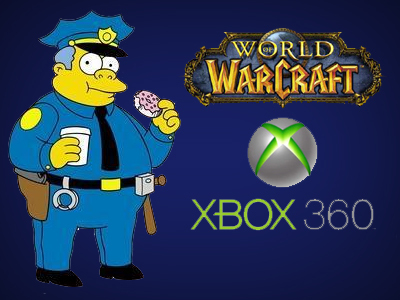 A few weeks ago, police reportedly caught a fugitive named Alfred Hightower in the most unorthodox manner – through World of Warcraft.